Back in 99, offstring was a fairly new concept. Duncan Professionals were doing offstring as a novelty act in school yards for a while, but to have a yo-yo designed with offstring in mind was a fairly new concept. The first time I saw the Henrys Viper was back in ’99 while I was at yoyo club on the Huntington Beach pier. The kid who had it boasted that he had something no one else did. He let everyone feel the rims but not throw it and then proceeded to stand up on the pier bench to make sure he could be seen. He launched the Viper up, missed the landing, and scrambled shouting “NO NO NO!” as the Viper rolled off the end of the pier into the water. A bit later, I actually acquired one in a trade and knew that it was special. It was a crossover that let people go from traditional string trick play to whatever this new concept was that cost the kid his Viper to the Pacific water. The Viper was a huge hit. Since then, Henrys has had a few yoyos that seemed to fail at catching the interest of yoyoers. 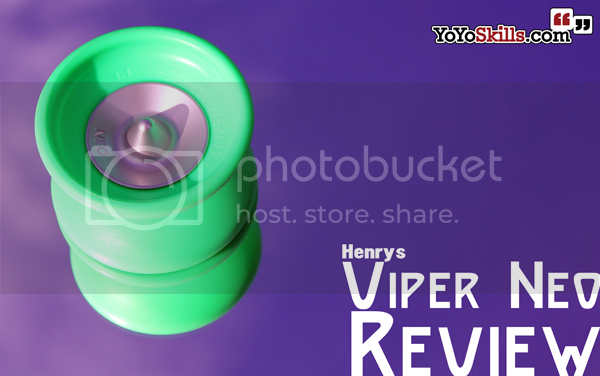 Then, just last August, the pictures of the entire new line of Henrys yoyos were released. I dropped a line to Henrys through a friend and Henrys got in contact with me about a review. I thought they were going to send me one or two yoyos, but the massive box that arrived had the ENTIRE new line. Henrys also hooked me up with a stack of packaged accessories. For the next four weeks, I have four new Henrys yoyos to review. First up, the Viper Neo. Henrys new box is clear plastic allowing you to see the yoyo from all sides. An instruction sheet in six languages can be found folded in the bottom. This is a far cry from the old velvet lined boxes the original Vipers came in but the effect is nice. You get a good impression of the entire yo-yo without actually being able to hold it. One confusing area though is that the Viper Neo is described as an all fields yo-yo. The web stores call it good for 1a, 3a, 4a, and 5a. I was not sure how to play it when it got to me for the review, but when I unpackaged the Viper Neo, it was setup for 1a so I decided to focus on that. I also did some 4a for good measure, but honestly that is not my strong suit. 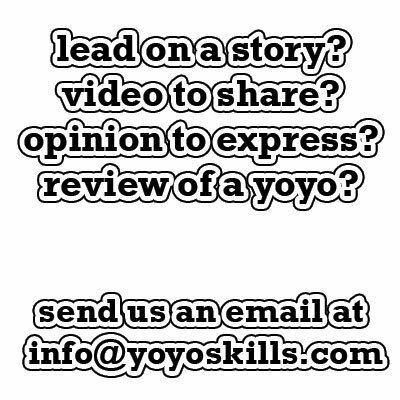 This yo-yo has a completely different construction than any other yo-yo I have reviewed in the last few years. The new Henrys axle system is extremely interesting and very similar to the Classic Viper system. 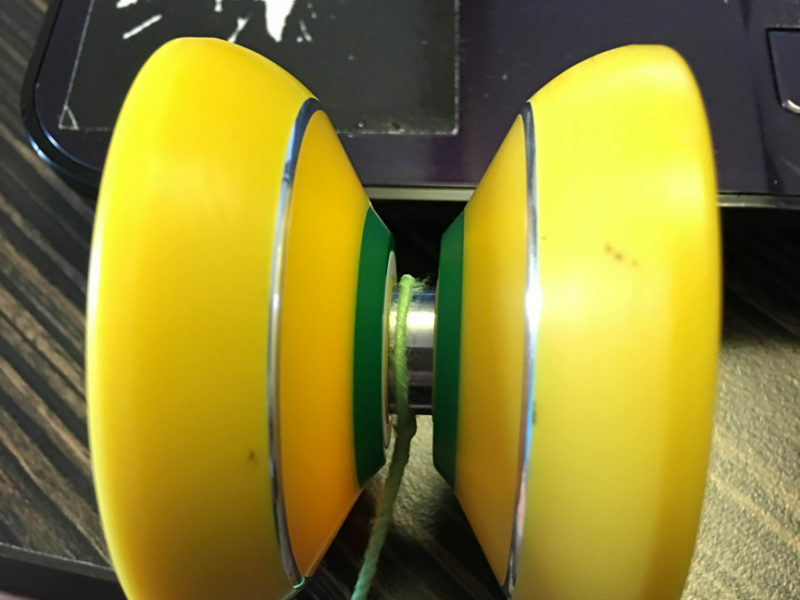 For those that don’t know, while most yoyos have identical halves the core of the Viper Neo does not. One of the halves has a deep well for the axle nut, while the other is just deep enough for the bearing. When you unscrew the halves the bearing essentially is trapped in place. The axle has a nut built into it which holds the D sized bearing and spacers in place. I think the idea behind this is to ensure proper axle alignment and to prevent the yoyoer from losing the bearing setup. It’s interesting engineering, but I am worried what will happen if a yoyoer over tightens the setup and gets the nut side stuck in the slotted side. On the aluminum core is also the response system. The Henrys response system uses what they call a Gecko Pad, but it looks about the same size as CBC pads and could probably take flowable silicone. Out of the box, the Viper Neo has one shim between the bearing and the shallow walled half. There is a little bit of vibe. I think it has to do with the soft rubber material. Right out of the package, the Viper Neo was smoother than a politician during re-election season but after a week of play the rubber rings felt more pliable and seemed to have more “give” to them. The vibration is not so bad that it hinders play but it can be distracting at times. The large 66mm diameter is matched with an average 43mm width which makes it about as easy to throw as a Duncan FHZ. Since the weight is only at 65 grams and mostly in the body, the Viper Neo has a floaty feel to it that makes it nice for slow and deliberate play. It has good stability but will lose spin if pulled off axis. At times the Gecko Pads seemed a little snaggy, but Henrys offers a “Spacer Pack” to widen the gap a few millimeters. I found that the best setup for me was to add a spacer to the nut side of the bearing. This configuration was a little less snaggy and still provided tight binds. The best thing about the Viper Neo is that it can hold its own in 1a style play, but also can handle 4a play without risking permanent damage. For 4a play, I found the Viper Neo to have a decent weight and good control. It could handle tilt correction easily but only on minor variants. Once the string hit the rubber the Viper Neo started dwindle on spin time. The open gap shape made catching the Viper Neo in a whip or on the string easy. I found that out of the package, the Viper was not easy to whip bind and took more deliberate movements to get the yo-yo to return in 4a mode. This is a fun yo-yo. The soft shell body ensures that this yo-yo has a feel like no other throw outside the Henrys line. The axle system seemed a bit over over-engineered and I think I would have rather seen something more traditional where the bearing assembly sat, but the system Henrys uses seemed to get their intended job done. I think that Henrys is on the right track and I would be willing to bet that this Viper will become as beloved as the original. 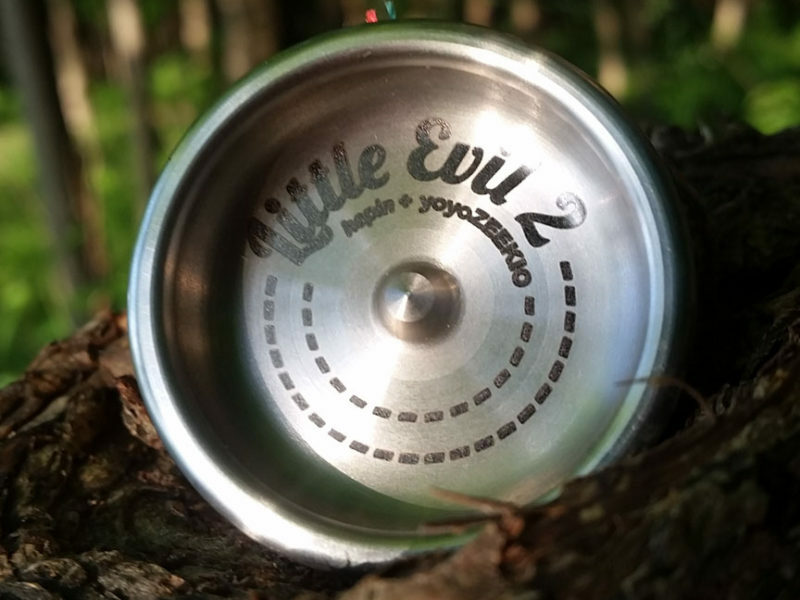 With this version being in the low $40’s, there is very little risk for a great yo-yo. and probably more retailers left by people in the comment section below. Edited by Dustin “Splugen” Gunter, who loves the idea of a smash-retardant yoyo. Just take it off the string! It’s good offstring! Thanks Chris for your contributions to the sport. 2 quick questions; first, do the gecko pads do unresponsive play? If the answer is no, you said that the gecko pads were about the size of cbc pads right? Do you think that i could switch them out if i got a viper? If so, would that be good for unresponsive 1a? i love mine so much. the Xl is so fun too!!! Very nice review, thank you for this! Yes, the shells are exactly from the old Viper. The Neo XL shell was used before at the micro diabolo. In 2007 I had a prototype with those shells on the old axle for offstring play. The Gecko Pad lasts very long. In my Python (which I have on my Belt) I have still the original ones. My setup is with 4 spacers. Does this mean we should expect the Mongoose Neo soon as well? Cool! You can get em in the US now. I’m definitely loving mine. We were really surprised to see them at worlds, and no one said anything about them. I can’t wait to see the review of the XL. Can you leave the “shells” off and play with it like that? I know it drastically reduces the width and weight of the throw, but it might be interesting. Colin and I were the first to grab these at World’s when they showed up on the yoyoguy table. So much fun. Took me straight back to 1998 when I first started. Definitely the best money I’ve spent on a yoyo this year. However I will say that for anyone who wasn’t yoyoing in the late 90s when the viper was a big deal, you may be a little underwhelmed by this throw. What I really want now is the XL version. We played with one of those for a while too and its super fun to play catch with at long distances. I got mine back in October, and I have loved it ever since. Only issue I have with it is that string rejections make it freak out and die. But its great for the price, and truly unique.